Production | Crews | Characters | Sourcing | Props & HUDs | Locations | Shoots | Join in! Sometimes using a scouted location for a shoot isn't enough. It might be too public (try shooting with passersby interrupting), or might not allow scripts, or have other issues. This is when you need to have a set built, either by yourself or by someone else in the crew. How you build a set depends on where you build the set. The two options are building on land that either you and/or the crew group owns (including a stand-alone grid/sim), and building in a public sandbox. Building in a public sandbox has several issues. There may be restrictions of what you can build (e.g. no weapons), limited use of scripts, and you may be competing for space with other users, who may or may not respect the space you're using. Perhaps the worst aspect of using a public sandbox is time limits. Most public sandboxes will have a time limit on how long your build can stay in the sandbox before it's either derezzed or deleted. That can be anywhere (on average) between 30 minutes to 6 hours. Some sandboxes belong to building groups and you have to be a member of a group to use. Often in these cases the length of time before deletion or de-rezzing is longer. Generally, working in any sandbox with a time limit 2 hours or under, makes your work more rushed and more prone to mistakes. In any case it's good manners to clean up after yourself in a sandbox, before the time limit. If you've put all the objects of the build into one or more linksets you can Take those linksets to save the build. Alternatively you can select all the objects/linksets at a time, and just Take those into your inventory. This creates a Coalesced object in your inventory that contains all of those objects/linksets (looking like ). A coalesced object in your inventory will have the name of the last object or linkset selected. This might be fine if that had a name like "Kitchen Build", but less so if it's just an object named "prim". The coalesced object may or may not be able to be copied or renamed depending if you have copy or modify objects included in it. Also, you may have issues if the objects you've selected are too close to the boarder of a (or in another) sim; if they include system plants; or too close to no-build parcels. To rezz a coalesced object, just drag it back into the sim. Ideally all the objects/linksets will be rezzed in locations relative to each other, that are the same as when they were taken into your inventory. Once again there may be issues if you are too close to the edge of a sim or to a no-build parcel. Individual objects may not rezz in the correct positions, or not rezz at all! When in doubt, it's always better to create or re-rezz your build in the centre of a sandbox as much as possible. If you're working in a sim you or your group own, there probably won't be any of these issues. 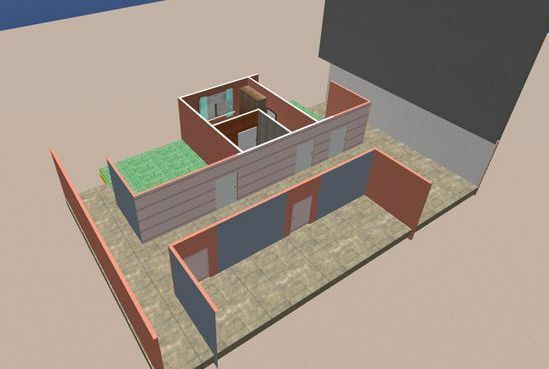 The linking of two or more objects creates a Linkset and is a basic building skill in Second Life and Hypergrid building. The big advantage of using a linkset is that all objects in it are by default selected so that when they are moved or otherwise edited (e.g. have a colour selected) that applies as a whole. Individual objects can be still edited by ticking an "Edit link" (or equivalent) button in the editing window. Linksets containing items with copy and mod have the same issues with copying and renaming as a coalesced object. Hypergrid/OpenSim > 256 In same Sim see Working with very large linksets in Opensim. A set that needs over 256 objects in Second Life will need more than one linkset, whereas in an OpenSim region a linkset can be much larger, provided all the objects are in the same region. The number of prims in a linkset will contribute to the total allowed in the region, and this can be an issue with sets with large numbers of prims. To reduce this you can edit the linkset and change Physics Shape Type from Prim to Convex Hull. 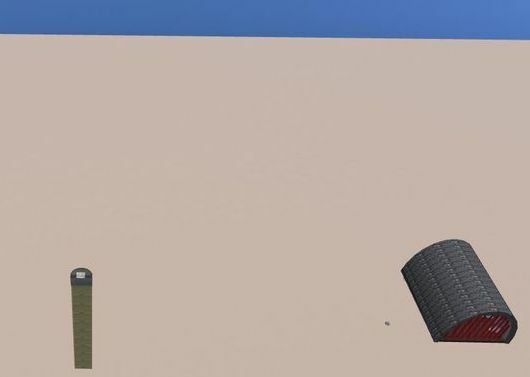 Any prims with holes in them with a Convex Hull type will act like they're solid, so if you're using one as a door frame you will need to tick Edit Linked, select that prim, and change its type back to Prim. See Using Convex Hull To Lower Land Impact for more detail on this. . When building a set it's important to realise that a Set is generally not a permanent location. That means that unlike a permanent building, you don't need to build a complete or fully functioning equivalent. You may not need to build an exterior of that set, or may build one separate to an interior set. You only need to build the parts of a set that will be seen in the final comic or image. This is similar to a theatre/TV/film set where due to cost, the only sets built are the ones either seen, or shot on. Figure 2 below shows a nursing home set constructed for Real Life Trips. You can still shoot from a viewpoint from above when the roof's lowered, because the top surface has a Transparency % set to 100. Figure 4 below shows this. The grey strip at the bottom is a side face of the roof prim. Figure 5 shows some detail of the main room. The props shown (TV, wardrobe, curtains, bet et cetera) were bundled into a BB set after being positioned correctly, and are rezzed when needed. The BB prim these are bundled into is located underneath the floor so that it's out of sight. The bathroom door is shut, probably because those props aren't needed for this scene. 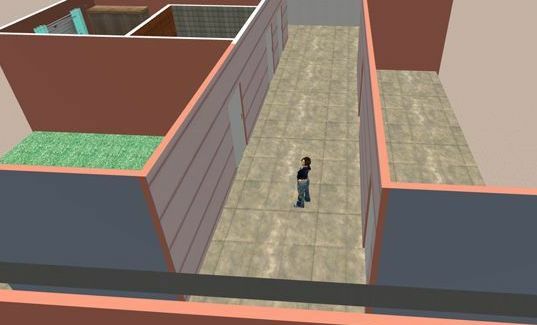 Figure 6 shows a view of a now open bathroom door with the bathroom props rezzed from a separate BB set. By having a separate BB set for main room and bathroom, you can then rezz only the props you need. The floating text you can see in fig 6 are the floating titles of each BB set. This would be normally not be shown in a snapshot, and is added to make it easier for a user to figure out which BB set they're using. Figure 7 shows a different set (the same one as shown in figure 1) which represents the flat of the character Jenn from Real Life Trips. 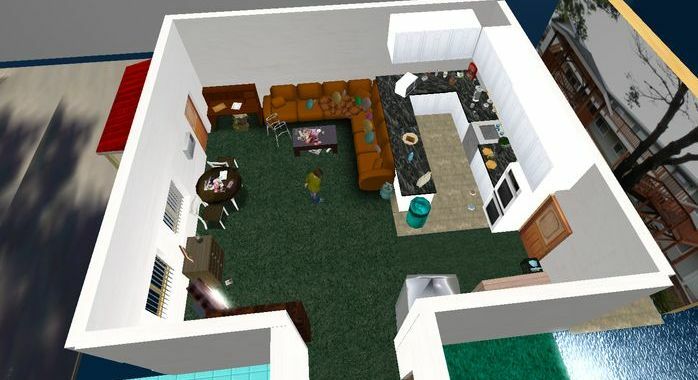 The layout is based on a flat from real life. Most of the props were bought or obtained either in-world, or via the SL Market Place. Others, such as the remotes, magazines and bills on the coffee table were created from outside sources. The entrance patio was created for one shoot, and both left and right side show in-world versions of a Translight. Both backdrops are used to imply an external scene outside the set, without having to build one. Instead of photographs, they could easily be snapshots from in-world. Figure 8 shows a an image made on a shoot at the Jenn's Flat set. In addition to props, animated pets were used to add character to the set. The two avatars were posed and snapshots taken. If the front door was open, the translight showing the street would appear outside. Not to be confused with the Paramour Builder's Buddy, a utility for working with prims where it's difficult to select their individual faces. 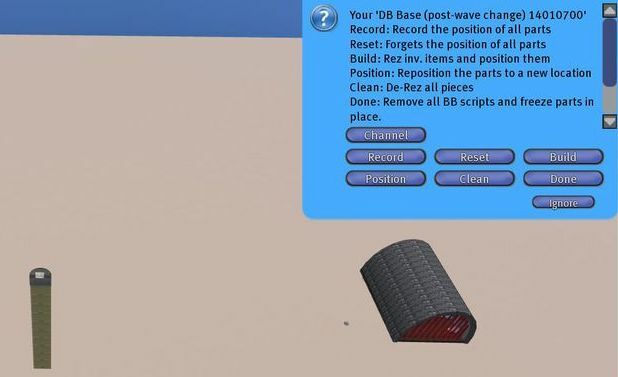 The BB works by having two different scripts, a base script which is placed in the "packing box" (or base) object mentioned above, and a component script which is placed in each item to be packed in that object. The base script sends commands to the component scripts based on a menu of options. The component scripts know which commands to follow by having the same channel manually set in their code. The commands and responses allow the base script to record he positions of of the component objects relative to the packing box. When the packing box moves the component objects/linkets move relative to that. Other commands rezz copies of the components stored in the packing box, change their positions, and to de-rezz those copies. All this works well with objects and linksets that are copy and mod. With all this functionality you can easily rezz a set you've previously created, use it for a shoot, and then de-rezz it until the next use. Note though that each packaged object/linkset will be running a component script while it's rezzed. Also, each base object will also be running a base script while it's rezzed. If you have a simple set that might only be a dozen scripts or less. However, a component linkset might also contain an object that has a base script in it and be a packing box for other components. You might say, have a base object that contains 11 linksets that when rezzed form the rooms and corridors of a house. Each linkset might also have an object (a rubbish bin, sign, etc) which is a base for component props used in that room. Assuming an average of 12 props per room, that means there are 13 scripts running for the rooms, and 143 scripts for the props! There is a command to rezz components and then delete scripts in the copies of the component objects rezzed. You might use that command for the props, and later manually delete them when cleaning up. 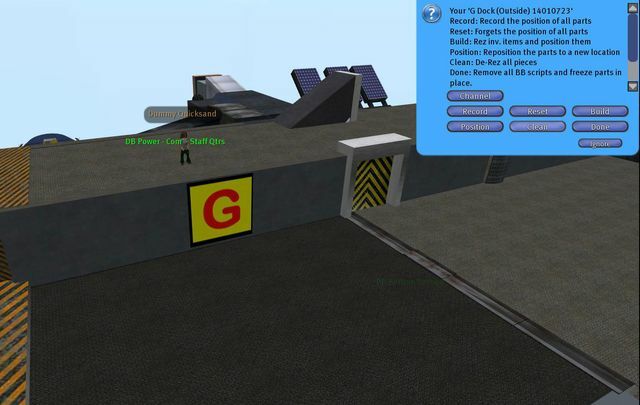 The following example uses an early version of a set used in Return to Second Life. 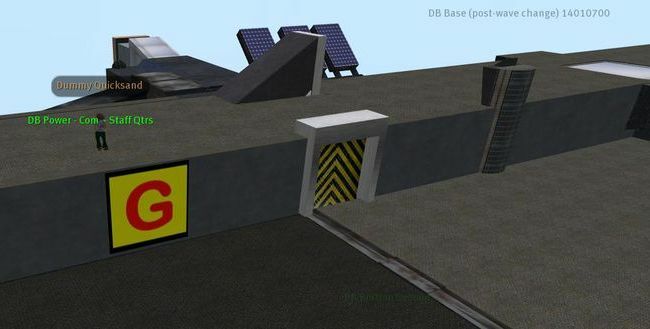 D'Olby's base is loosely based on a long gone freebie in Second Life. It's a floating warehouse that's been build one part at time, and won by another character (Dr Buggle) in a card game. In figure 9 we see the packing box / base as rezzed in a sandbox platform. The nissan hut at right is someone else's build and not part of base. The base is disguised as utility shaft at the centre of the base. Nothing much to see so far. The owner of the base object touches it and the following menu appears. The Build option is selected and copies of the component linksets are rezzed in place. 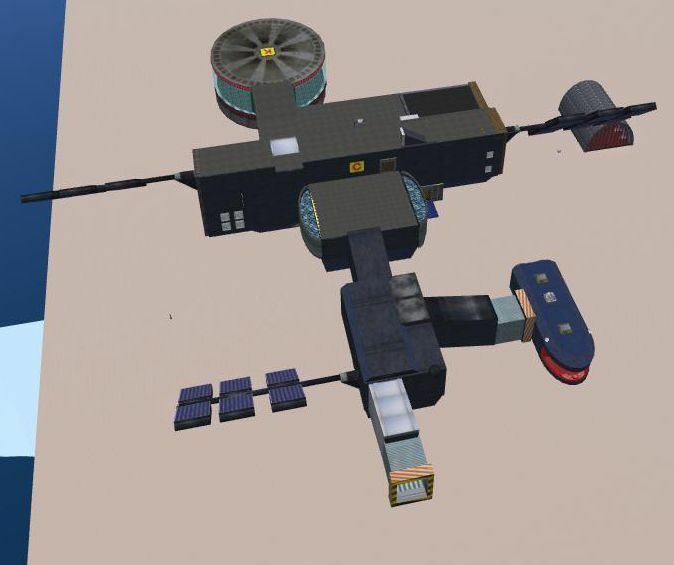 There are 8 component linksets here: Command Module; Left and Right solar arrays; the Centre Hull; the Kitchen Block; the Warehouse Block; the Lifeboat (at bottom right); and the Lower solar array. If you move the base unit (which is the light grey spot above the the "C" sign) all of these linksets will move with it. We're not quit done yet. There are number of base objects in each linkset that can rezz props for their area. For example there are two hidden base objects that will rezz railings and antennae for the top deck. We can see floating text for two of these: DB Power - Comm Staff Qtrs, which rezzes props in the power room and above in the staff quarters; and DB Base (post wave change) 14010700, which is the main base unit for the whole set. The number 14010700 is the number of the channel used for the base and component objects in the BB set. Putting the number in the names of each (after a description) is another way of making sure of putting the right components in the right base object. The prominent "G sign" is also a base object. Touching it brings up this menu shown below in figure 13. Notice the "G Dock(Outside) 1410723" at the top of the menu. This is the name of the base object, and once again the 1410723 indicates which channel is used (and this must be unique from other base-component sets). Selecting Build rezzes the props for G Dock as per figure 14 below. To remove the props we touch the G sign again and once again the menu pops up. Selecting Clear de-rezzes all the props previous rezzed by that base object. It's good practise to clean up after yourself in sandboxes and other areas you're temporarily using. This also includes BB sets. If you've rezzed props as well as linksets it's clearer if you clean up the props first. If you delete the linksets before the props, you'll have a bunch of props floating in space, all with component scripts but without any base objects to clean them up. Have fun manually deleting the props! Once all the linksets and props have been de-rezzed, you'll be left with the base object, looking (in the above example) link the image above.